They were possibly the most challenging three hours of my life! 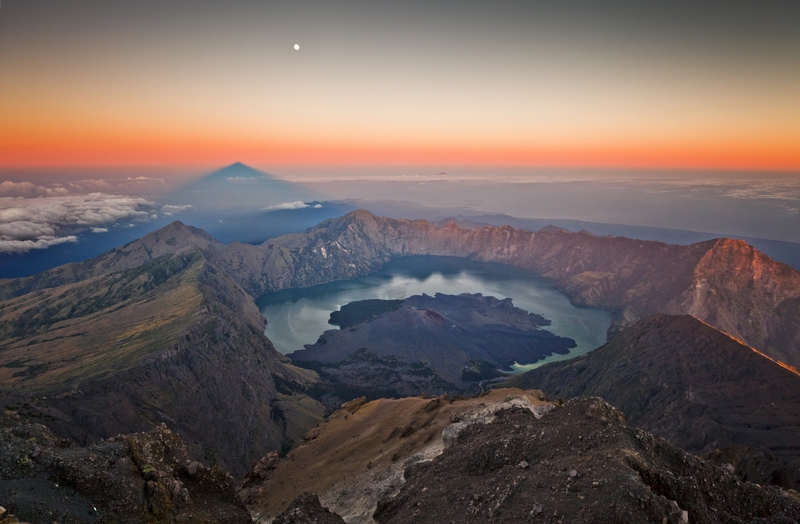 Standing at 3,726 meters (12,224 feet), Mount Rinjani claims the number two spot as Indonesia’s second highest volcano, but it rates as one of the world’s best treks. 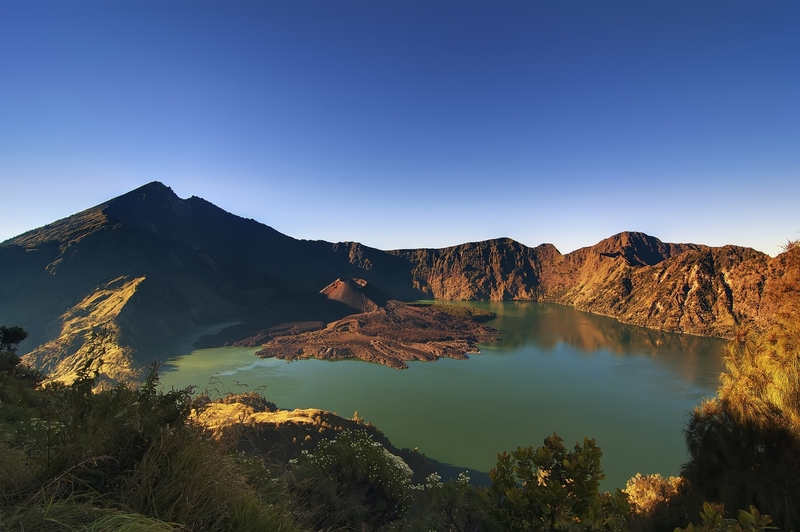 So, it’s no wonder that avid mountain climbers travel from around the world to Lombok to observe the rising sun from the wind-swept summit of Rinjani. The active volcano’s massive caldera (6 kilometres by 8.5 kilometres), which is partially filled by a crater lake, is another world-class feature of the trek. Fortunately, as an expatriate teacher at a school on Lombok, I had the opportunity to tackle the task of climbing from almost sea level to an altitude of nearly 4,000 meters with a good-natured group of coworkers. However, my coworker friend signed us up for the two-night, walk-‘til-you-drop package. Most people take the three or four night option (my personal suggestion) which allows more time on the rim and lake shore. Either way, people should not miss the main point, which is the view from the top is worth every step you take. The remaining words will do their best job to truthfully describe the experience of climbing Rinjani while shedding practical, trip-planning information. We left Sembalun village, the departure point for those headed to the summit, at approximately 6am. However, the actual trekking started at around 9:30am from the Rinjani Trekking Center, where you pay a small fee. Upon starting, you’ll be traversing the grassy slopes at the foot of the mountain with zero shade, so bring a good hat. Leading the way was our guide while three porters trailed our group with all the required equipment (tents, cookware, food, water, snacks, etc…). In the mid afternoon, you will reach a camp site where the porters prepare lunch--noodles, fresh vegetables, a hard-boiled egg and a bottomless supply of crackers. After an hour-long rest, trekkers make their way up to the rim, the final destination for day 1. Breath-taking views can be observed from your campsite, from which the crater-lake is in full view in addition to the summit (if it's not shrouded by clouds). On my trip, I witnessed a dramatic sunset overlooking the lake while a boiling mixture of clouds brewed in and around the crater. The panorama is your reward (in addition to a hot meal) for the previous hours of toil. Not long after, you’ll hop into your sleeping bag and tent (set up by the porters) and immediately fall asleep. This is where it gets a little tricky. Sunrise summit seekers get up at 2am for a quick snack of tea/coffee and crackers. By 3am you should be mentally prepared to carry your cold, aching body to the summit. As one will hopefully know, it is quite dark at the unholy hour of 3am, calling for the use of a headlamp and extra batteries (just in case). You will also need a good jacket, as temperatures at the summit can be as cold as five degrees Celsius. However, the strenuous activity should keep your body temperature up, as your goal for this leg of the journey is to reach the summit before sunrise. The three hours of scrambling up to the top were possibly the most strenuous three hours of my life. Be prepared to trudge through deep, gravelly volcanic sand. For every step you take forwards, you slide at least two steps back. If and when you reach the summit, you’ll be rewarded with a one-of-a-kind view. With Bali and Sumbawa islands posted in the foreground and the ocean stretching as far as the eye can see, you will observe the birth of a new day from over 12,000 feet on an active volcano. After descending to the rim, your group departs for the crater-lake, which is where you'll have lunch. Before or after lunch, people can also swim in the lake or take a dip in the hot springs. As an aside, the lake was the one disappointment I had on the entire trip. As much as the terrain is gorgeous, unchecked littering has severely affected the lake’s shoreline and a lot of the other camping spots too. Either way, don’t expect to relax by the lake for too long. You will quickly ascend to the opposite side of the rim from where you slept the first night. Upon arrival, you can collapse and claim victory over a more-than-twelve-hour day of trekking. You can wake up on day 3 with a sense of mental ease, because you’ll know that a hot shower and soft bed are only hours away. 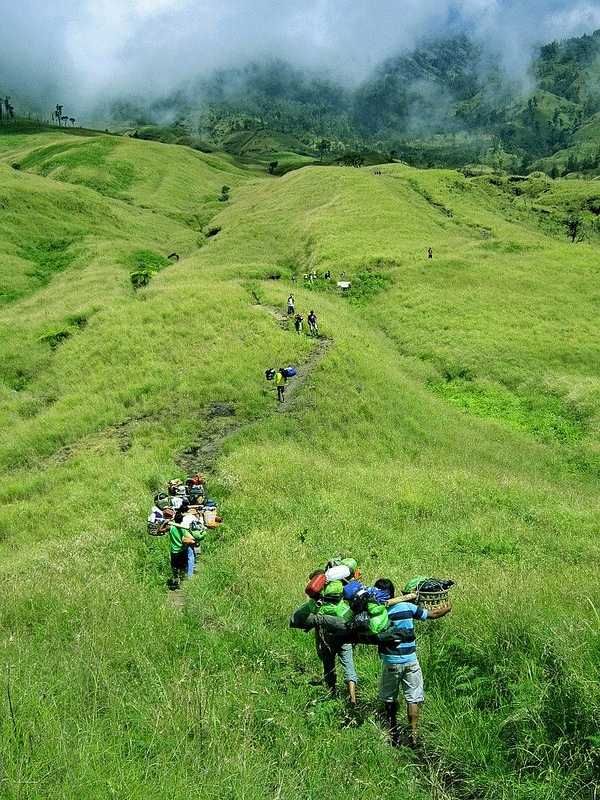 The guide will lead your descent to Senaru village, which you will reach around noon, but you will not get there without navigating countless switchbacks marked by large boulders. With what felt like lactic acid burning through my legs, I would claim the descent to Senaru as the second hardest section, following the twilight summit scramble. I take that back. One of the hardest moments for me was reaching the edge of the Rinjani National Park, which we all assumed was the end of the trek. In reality, we had about another two-hours worth of flat ground to cover until we reached Senaru and our car. So, you've been warned. The trek does not end at the edge of the park. You can do your victory dance once you've actually reached Senaru. When I finally reached the village, a wave of relief and satisfaction surged through every cell of my body, as I felt that I had accomplished an amazing feat and taken advantage of a once-in-a-life-time opportunity. Not to mention, I savoured the only soul-pleasing Bintang I've ever had. And the drive home? There's not very much to recall. 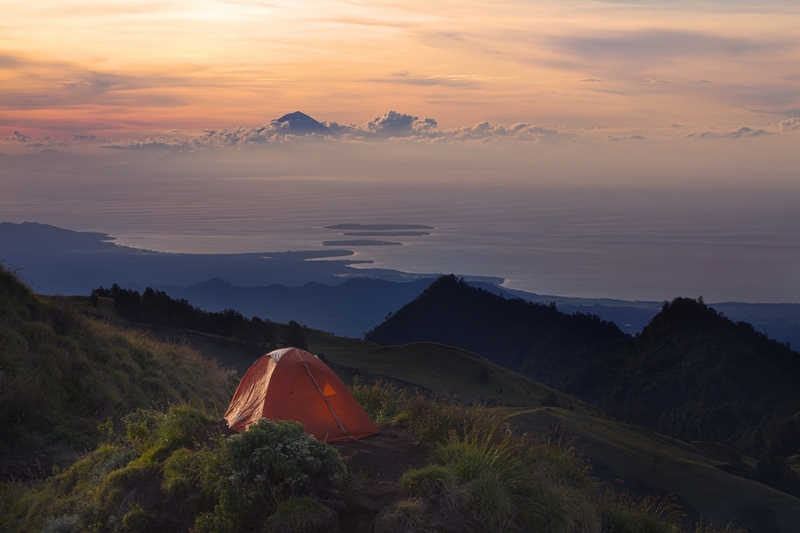 Everybody was drowning in a slumber that you can only attain by climbing Mount Rinjani. Pricing changes depending on how many people are in your group. The more people you bring, the cheaper the cost. It also depends on which company you hire. I paid Rp.2,000,000 and went with a group of six people. Also, you will want to bring extra cash to tip the porters and your guide when it is all said and done. My group of six tipped about Rp.50,000 each, which was split among four people. The porters truly earned it, too. When you see how much weight they can carry up the volcano, you'll also think they deserve a good tip. Not to mention, they cover all the terrain in rubber flip-flops. It’s very impressive, to say the least. For more information on Mount Rinjani and the different trekking packages,visit the following company websites. My trip was organized via Rinjani Trekking Club and their service was flawless.